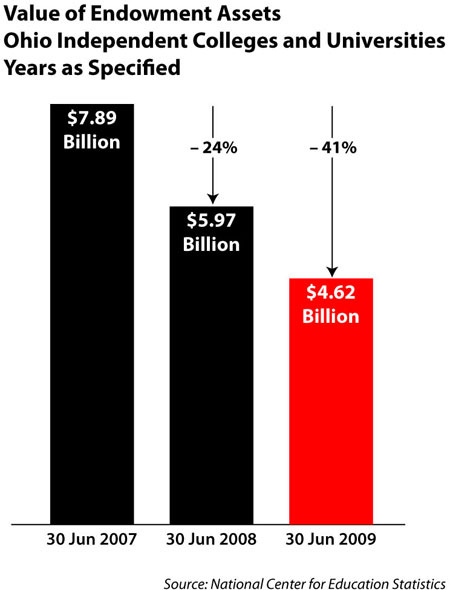 On this week’s graph we estimated a loss of more than a quarter-billion dollars over two years in expendable revenues from our member institutions’ endowments. First of all, endowments are a source of revenue as campuses normally allot five percent of their value to the various purposes for which the endowments were established. An endowed chair for a professor typically has an endowment of at least $500,000 supporting the holder’s teaching or research; endowed scholarships could have nearly any amount above a few thousand dollars. Why five percent? In normal times, the value of endowment funds usually increase by more than that, and in some recent years much more. Reinvesting any additional growth into the fund is a hedge against inflation, as it increases the next year’s base for calculating spending, and also, over time, limits losses during bad years like 2008 and 2009. So, using $7.9 billion at the end of the 2007 fiscal year as a base, the loss of $1.9 billion in endowment value during fiscal 2008 means that the campuses didn’t have five percent of that, or about $96 million, to spend from their endowments that year; and the cumulative loss of $3.3 billion resulting from the additional losses during fiscal 2009 resulted in almost $164 million in spendable revenue lost in that year. Add them up and you get a loss of almost $260 million over the two year period. You can see how strapped our member campuses have become, and how deeply they had to dip into their own resources to support their students this year, especially when the drastic cuts in state financial aid came this past fall.